Since I last posted, I've gotten a number of documents: from the City Archive in Hannover, Grandpa Berneburg's birth certificate and his father, Andreas' death certificate. Grandpa's is interesting but doesn't clear up any issues, but from great-grandfather Andreas we get a few bits of information -- his birthplace and his parents' names, which is exciting. 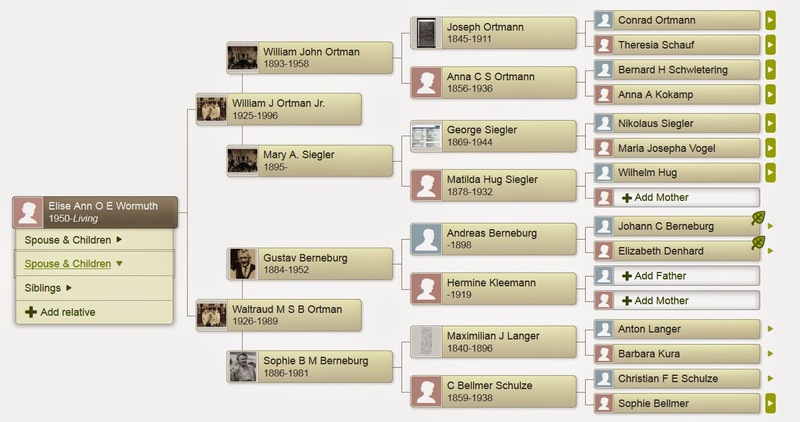 So now we have great-great grandfather, Johann Claus Berneburg, and great-great grandmother, Elizabeth Denhard, both of Eltmannishausen, a tiny town near Eschwege, in Hessen. Today, I ordered death certificates for Matilda Hug Siegler and Sophia M. Siegler, her mother. Ta da! Hermine Kleeman might remain a mystery for a while; she's proving to be elusive. And we have information on 12 of the 32 great-great grandparents! That's exciting to me. Yesterday I spent three hours in the Family History Library at our local LDS church. That's three hours in a dark room looking at barely decipherable microfilms that I ordered from Salt Lake City. This is the kind of thing I'm trying to read! So, I'm sorting through all this stuff and will let you know any interesting things as soon as I find them!